CHICAGO (CNS) — Six Chicago area pastors joined Catholic Extension on a trip to the southwest border to learn about the challenges facing migrant families and to provide funds for various outreach ministries. The July 11-13 trip to the Rio Grande Valley in Texas and Mexico allowed the priests to meet with people being served by Catholic-run centers and parishes. Among the locales visited were La Posada Providencia (The Providence Inn) in San Benito, Texas, and Proyector Desarollo Humano (Human Development Project) in Penitas, Texas. In San Benito, the delegation met numerous migrants, including a Honduran mother who said that she had been approached by criminals who threatened to kidnap her 8-year-old daughter and decided to head north for safety. In Penitas, the priests met immigrant women and children at an outreach center that addresses health care, education, social services and evangelization. The center, run by the Missionary Sisters of the Immaculate Heart of Mary, is connected with St. Anne Parish, which the sisters built in response to peoples’ desire for a worship space. Sponsored by the Sisters of Divine Providence, La Posada Providence is regularly approached by immigration officials asking to shelter recently paroled immigrants and asylum-seekers, according to Catholic Extension. Both programs received funding from Catholic Extension’s Family Reunification Fund, established in June in response to the separation of children from their parents as they entered the United States along the border with Mexico. Proyecto Desarollo Human received $45,000 while La Posada Providencia received $25,000. The trip included stops across the border in Mexico, where the priests visited two sites that aid migrants, including those who are seeking asylum in the United States and those who recently have been deported and those attempting to be reunited with family members. 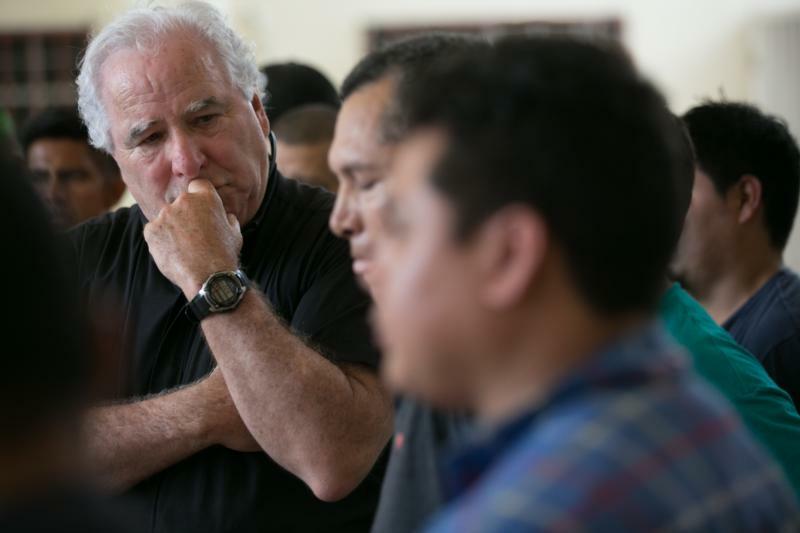 Joe Boland, Catholic Extension’s vice president of mission, said the visit allowed the priests to glimpse the dire circumstances facing migrant families. Other stops on the trip included the dedication of Sacred Heart Church in Hidalgo, Texas, located a short distance from wall marking the Texas-Mexico border. Catholic Extension provided $75,000 in funding for the new church. Bishop Daniel E. Flores of Brownsville, Texas, presided at the dedication Mass. Based in Chicago, Catholic Extension raises and distributes funds to support U.S. mission dioceses, many of which are rural, cover a large geographic area, and have limited personnel and pastoral resources.